INCHEON: Marching bands and traditional Korean drums greeted the US and International teams at a colourful 11th Presidents Cup opening ceremony in Incheon yesterday. 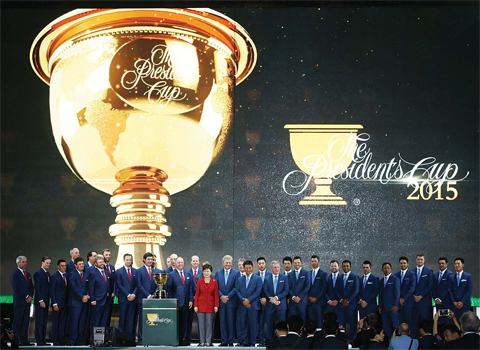 Appropriately, given the name of the event, South Korean President Park Geun-Hye and former US President George W. Bush gave speeches after the players were treated to a perfectly choreographed ceremonial display for the first Presidents Cup to be held in Asia. After the unveiling of the golden trophy at the Songdo Convensia just a kilometre from the Jack Nicklaus Golf Club venue, Bush spoke to salute the long ties between the US and South Korea. He recalled that during the Korean War almost exactly 65 years ago, on September 15, 1950, General Douglas MacArthur led US troops on a surprise landing in Incheon which changed the course of the conflict and enabled Seoul to be recaptured. Bush also noted that the teams were playing for pride, with all money generated donated to charity in the biennial event which has raised more than $32 million for good causes since its inception in 1994. Each of the 24 players nominates a charity to receive a portion of funds raised. Other speakers included golf legend Jack Nicklaus, who designed the course on which the players will battle over the next four days in what he called “the greatest sporting event”. “We have the world’s number one and two in Jordan Spieth and Jason Day,” said Nicklaus, “and the first players from Thailand and India to play.” International team captain Nick Price said his team were “so excited to be in Asia for the first time”. And his opposite number on the US team Jay Haas thanked Park for her support in bringing the event to her country. Both captains introduced their respective teams as animated caricature “avatars” of each player were displayed on a giant screen. The Presidents Cup has been dominated by the US, who have only lost once in the 10 previous editions of the match play team event. Play begins today with five foursome matches and continues Friday with five fourballs. Saturday sees four more foursomes and fourball matches before reaching a climax on Sunday with 12 singles. Meanwhile, Bubba Watson and JB Holmes will lead the US defence of the Presidents Cup against Adam Scott and Hideki Matsuyama when the 11th edition begins on Thursday for the first time on Asian soil. But the number one and two players in the world, Jordan Spieth and Jason Day, were kept apart as captains Nick Price and Jay Haas selected their five pairings Wednesday for the opening foursome skirmishes at the Jack Nicklaus Golf Club in Incheon, South Korea. Four months ago Spieth watched from the clubhouse as big-hitting Dustin Johnson threeputted the final green to hand him the US Open. World number two and US PGA champion Day will partner Steven Bowditch in an all- Aussie pairing against Phil Mickelson and British Open champion Zach Johnson in the penultimate match Thursday. Asian rookies Anirban Lahiri and Thongchai Jaidee, the first Presidents Cup representatives from India and Thailand respectively, go head to head with Rickie Fowler and Jimmy Walker. And it will be South Africa versus the United States when Louis Oosthuizen and Branden Grace face Matt Kuchar and Patrick Reed. But it is Holmes and Watson who will have the elementary task of the first tee shot to get the action under way at 11:05am local time (0205 GMT) against former world number one Scott and Matsuyama. Scott has discarded the broomstick putter he used for years and will play with a standard length club this week. But that’s not a worry for Price. “Adam putted really well the last couple of days,” Price told a news conference. “He’s had a month off and he’s been working very hard. The Australian and Japanee players teamed up successfully in the foursome format two years ago to defeat Zach Johnson and Jason Dufner. “He and Hideki, they play practice rounds during the year together. They played so well together last time. They were great. So they were sort of an automatic for us.” Price revealed his hand was slightly forced as Charl Schwartzel is sick, having picked up a flu-type virus earlier in the week.